New: The tooltips and popovers can now be shown/hidden with specified delays. 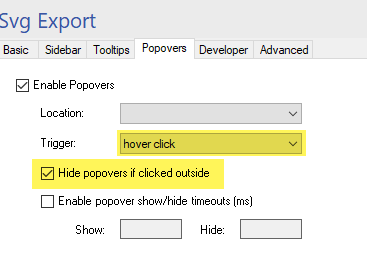 You can specify hide and show delays, the tooltips and popovers will appear on mouse entering the shape or mouse leaving the shape with the specified delays. top/left/bottom/right: Will show the tip or popover on the left/top/bottom/right of the corresponding shape. top/auto left/auto bottom/auto right: Will show the tip or popover as specified by default, but move it if it does not fit within the view. Fix: Publishing using the option “Export Single Page” NRE when ShapeSheet window is opened, fixed in version 1.2.9. The extension showed “Null Reference Exception” error if you open a ShapeSheet window in (as a separate sibling window) for some shape on the diagram being published, and “Single Page” option was selected. Now it should work properly.